The Buyer Representation Agreement establishes the agency relationship between the Buyer and the Broker (Real Estate Company). Briefly this agreement states the responsibilities of both parties, which are listed below. Broker’s Responsibility - The Broker and Real Estate Agent shall act as the fiduciary Agent for the Client and place the Client's interests above his/her own interests at all times. Client's Responsibility - In return, the Buyer or Client agrees to work exclusively with the Broker’s agent in locating and acquiring an acceptable property. Other items often addressed in the Buyer Representation Agreement include: Broker compensation, agreement effective dates, competing offers, intermediary relationships, Broker's assistance for unlisted properties e.g. For Sale by Owners or builder owned properties. Read over the document thoroughly to make sure you understand and ask questions if you don’t understand something. The benefits to you as a buyer are having one agent that knows your wants and needs and is legally committed to help you achieve your goals. By having the exclusive contract, the buyer’s agent is not trying to sell you each and every house you look at. 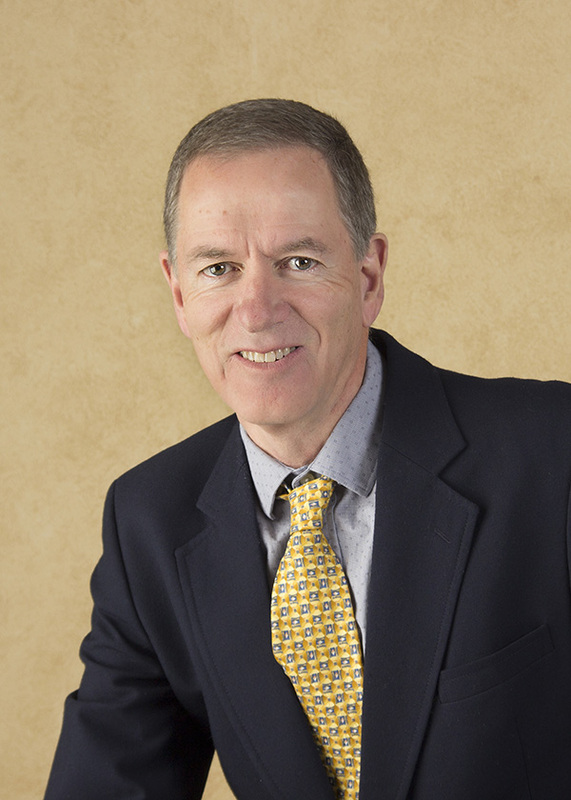 The agent's goal is to HELP you BUY a home never SELL you a home. Questions? Is the real estate agent asking you to sign a form that ties you to use only that agent? Are you the buyer uncomfortable because this agent may not do the things you want him to do, or you find you are just not comfortable working with him or her? How do you handle this? Below are my solutions. Solution 1: Make the effective dates for a short period of time - 1 to 7 days, for example. You can work with me for that short period of time, and if you are happy you can sign a Buyer Representation Agreement for a longer period. If not, then you are under no obligation to continue to work with me. Solution 2: I will sign a Buyer Representation Termination Agreement that you can sign at any time to terminate the agency relationship if you are not happy working with me. The Buyer Representation Agreement confirms that you are working with a single agent, focused primarily on your needs. If you are not happy working with me at any point in the process, we can end the agreement. I would rather terminate the agency relationship than continue working with an unhappy client. My life and work are more enjoyable if I am working with happy satisfied clients and I will do my best to keep them that way. Summary: The Buyer Reprensentation Agreement insures that the Buyer has the same level of representation as the seller. The agent is working on behalf of the Buyers to find them the right property and to negotiate the best price. The agent knows the Buyer will be working with him exclusively and can focus on helping that Buyer. 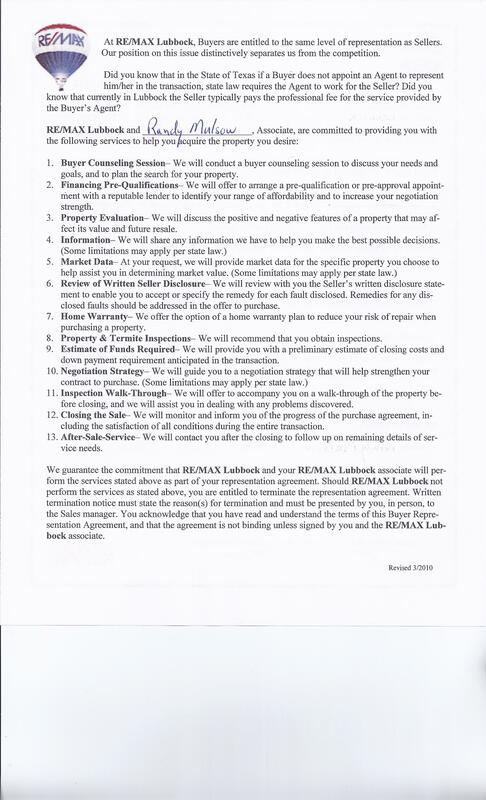 Below is the Buyer Representation Agreement that I use. 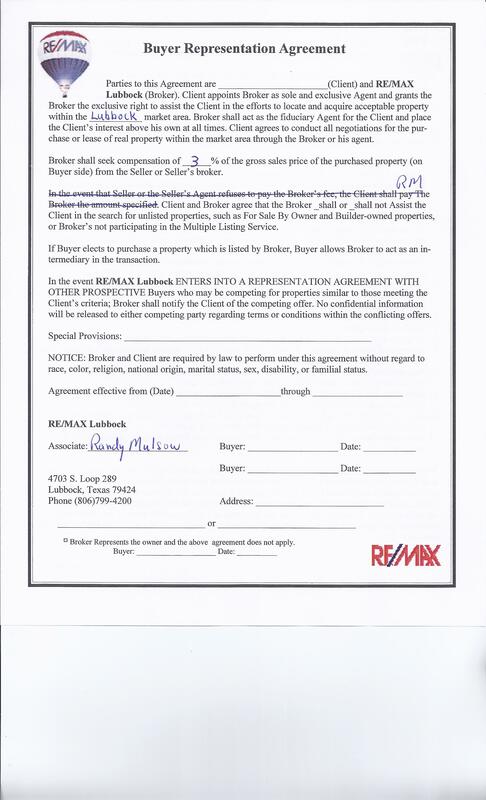 Note that I cross out and initial the standard language about the Buyer being responsible for the Broker's fee if the seller or seller's agent refuses to pay. I have never had this happen, and if it does I would not expect my client to be responsible for it.